The first leg of the 2012 EuroCup Women quarter-final did not go well for French teams with two losses by 9 points. However the number one seeds Dynamo Kursk remain unbeaten. Dynamo Kursk trailed for most of the match against MBK Ruzomberok but ended up winning thanks to a three-ball by Anna Petrakova with just over a second to play. Petrakova finished with 19 points while WNBA and former USO Mondeville player Temeka Johnson fired in 22 points and dished out 3 assists for the Russian side. Dynamo Kursk's all star roster included former Latvian international Gunta Basko-Melnbarde who scored 9 points on her début for the club in this competition. For MBK Ruzomberok Carmen Guzman and Katarina Tetemondová both scored 22 points. You can watch some game highlights from the game in the youtube clip. In the other match without a team from France Botas Sports Club managed to sneak a win against Gran Canaria 2014 (67-64). 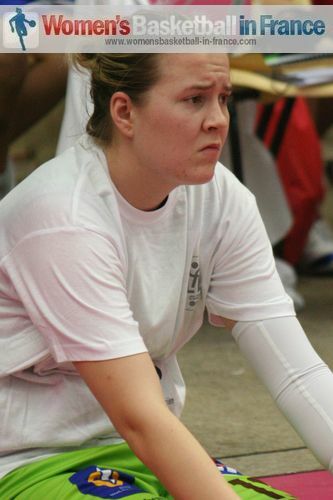 The Turkish side's victory was mainly due to Courtney Paris who scored 24 points while picking up 22 rebounds. She was helped by Quianna Chaney who poured in a game high 27 points. The Spanish team were never intimidated and fought hard to stay in the match. Dandra Moss led the scoring with 21 points but it was the the double doubles by Vanessa Blé (15 points and 10 rebounds) and Astou Ndour (10 points and 13 rebounds) that kept them in the game. A cold weather front messed up the travel plans of Hainaut Basket which resulted in them traveling all day across Turkey. The match was delayed for about three hours and despite not having a shoot around, Hainaut Basket had the better of the first half to go int the locker room leading (35-28) against Kayseri Kaskispor. During the second half of the match the effects of the day's traveling showed as the players from Hainaut Basket tired and were unable to hold off Nakia Sanford. The hosts rode their luck and with a 24-12 final-quarter burst were able to win the match (68-59). Sanford finished with 19 points and 16 rebounds. Marina Solopova (in picture) led the scoring for Hainaut Basket with 17 points while Amisha Carter finished with a double double of 15 points and 11 rebounds. Closer to home in France, Arras allowed a 13-point lead against BC Chevakata with 15 minutes to play turn into a 9-point deficit by the end of the game. Basically once Pauline Akonga-N'Simbo (in picture) stopped scoring, just 4 points in the last 15 minutes Arras struggled offensively. In addition Krissy Badé's foul problems left them short in defense. On the other side Jessica Davenport from the opposing team stepped up aggressively which sparked her team-mates into action. They started to draw fouls and with ice cold shooting from the free-throw line more or less blew Arras away with a 29-18 final-quarter finish. For Arras Akonga-N'Simbo had 23 points while Nadezdha Grishaeva and Gabriela Marginean added 21 and 15 points respectively. Leilani Mitchell led the rebound stats with 13. She also scored 6 points and dished out 5 assists. 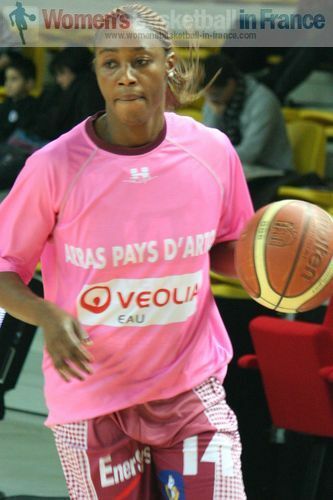 Davenport, who played in France for Challes-les-Eaux at the start of her professional career, led the scoring with 17 points for her team. Svetlana Makhlina was next up with 16 points.